When you unlock and open the driver’s door with a remote transmitter, the seat adjusts automatically to one of the two preset positions. 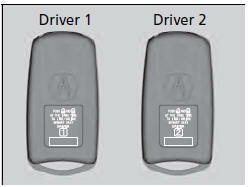 The multi-information display shows you which remote transmitter you used to unlock the vehicle when you enter. Using the multi-information display, you can disable the automatic seat adjustment function. You can cancel the driving position memory link and customized settings. Press and hold the lock and unlock buttons at the same time. The LED in the remote transmitter blinks twice and the default settings are restored. To turn the memory position link settings back on, repeat this procedure. The LED will blink once.